There were a whole host of different and varied sports cars and even motorcycles that arrived in the US after World War II. To this day their very names elucidate a passion among enthusiasts – be it Triumph, MG, Austin-Cooper, Lotus, Austin-Healey, Mini-Cooper or in the world of British motorcycles –BSA, Norton, Greeves and Triumph bikes. However in the eyes of many sports cars the original Jaguar roadster was “it”. It can be said and noted that the Jaguar Automotive Company had over time and previous to the War (World War II 1939-1945), had built sports roadsters previously. Indeed Jaguar had carved out a name and reputation with these products especially the Jaguar Roadster SS-100. However things being what they were economically after the war , with the home market for such premium vehicles being very small indeed if not non existent , the export market especially to the United States – the USA as well as the smaller but emerging automotive sports market of Canada. To this purpose both Jaguar’s engineering staff – with the chief engineer at the helm as well as innovative indeed daring new styling , with one of Jaguar’s co-founders being in charge of the styling end. What resulted was an impressive engine which developed peak power at a then relatively high 5,000 r.p.m. cycle (revolutions per minute). In addition a feature which was at that point in time only found on a limited number of high end racing cars and certainly not production vehicles. This mechanical feature of great merit and power to auto engine performance – was the introduction of double overhead camshafts. The specs of the post war Jaguar engine itself was a ¾ liter inline six, with a massive crankshaft, 7 main bearings powering along with a very long engine stroke. At 5200 r.p.m. the engine put out a full 160 nimble yet graceful horsepower.Although this double overhead cam setup for the engine initially was intended not for the Jaguar Roadster, but the run of the mill production Jaguar Sedan, it was installed without complaint in the Roadster. The interesting quirk of fate that it was only supposed to a temporary stopgap measure while another engine was in the process and testing – or at least in the planning stages for the Jaguar Roadster. Market and customer approval, especially in the valued export market was so grand that this setup, with the dual cams, stayed on as the standard production model for the Roadster. 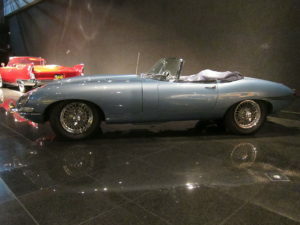 The Jaguar Sedan with the same engine eventually was released in the year of 1951 as the Jaguar Mark VII model line whereas the Roadster Model – The Jaguar XK120 was introduced earlier in 1948. The Jaguar XKE 120 became an instant hit – both for its innovative and graceful styling, as well its speed, acceleration and agility. 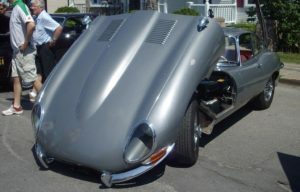 It can be said that the Jaguar XKE120 came to symbolize its name – that of a sleek, fast feline and hunter. Speeds were up to 120 miles per hour, with a then modest price of approximately $ 2,500 US dollars. To this day of all the post war British sports car and vehicles – be they cars or even motorcycles it is said among enthusiasts of vintage cars and racing automotive products that nothing comes close or matches the mystique of that early classic Jaguar Roadster the XKE120.